Donal Wylde’s “The Light of Other Days” is a pictorial portrait of Clonmel and his book will be transformed into an exhibition with the assistance of South Tipperary County Museum, which will open on Saturday July 23, 2011. The book is the result of several years of research by film maker-photographer Donal Wylde who was the former chief photographer of The Nationalist newspaper. Donal has assembled a wonderful, atmospheric collection of pictures from town and county life in the sixties and seventies, during a period when Clonmel was at its most diverse economically, politically and socially. Since then many of Clonmel’s factories and craft industries have long since disappeared and can be seen only in the images that photographers like Donal captured back in the day. Pre-publication orders for this limited edition book are being taken by South Tipperary County Museum, Clonmel, museum@southtippcoco.ie or call Bernadette on 052 61 34552. Admission to museum is free and all are welcome. 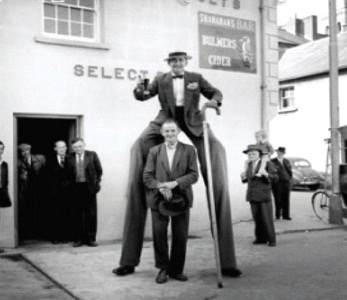 Onlookers and patrons of Shanahan’s Bar at Market Street Clonmel amused at the antics of Cllr.Jack Ahessy on his lunch-break from the affairs of Tipperary South Riding Co.Council, when he met Bertram Mills Circus ‘stilts’ man promoting a visit to the town in 1961. One of the images from “The Light of Other Years” Donal Wylde’s Clonmel, a book of photographs from the 1960s/70s mostly of his early career in “The Nationalist”. Edited by his former colleague in Radio Telefis Eireann Peter McNiff, the book is at present with the printers and will be available in local bookshops soon.